Hollywood has a few failure modes when it tries to adapt classic fairytales and fantasy stories for the umpteenth time. And one of the main ones is, “Let’s tell the origin story that’s never been told before.” Pan is the latest fantasy prequel to show why this is a bad idea. Remember Oz, the Great and Powerful? That prequel film which focused on a male character from The Wizard of Oz, instead of Dorothy Gale, and sort of missed what was great about The Wizard of Oz? Great. Then you’ve pretty much seen Pan. In Pan, there’s no Wendy Darling—just as Great and Powerful had no Dorothy—and the fairy Tinkerbell is also relegated to a super-brief cameo. And instead, we get the origins of Peter Pan, who is basically Luke Skywalker crossed with Harry Potter. In this film, Peter Pan is an orphan who’s mistreated in a bleak World War II London (why World War II? Search me) until he’s whisked way to Neverland, where the evil pirate Blackbeard (Hugh Jackman) is enslaving tons of boys. Blackbeard has a ginormous mine where they’re mining for Pixie Dust. But soon, Peter Pan discovers that he’s not just a random boy, he’s the prophesied savior of the fairies and the Native American tribes that live on Neverland—but Peter Pan can’t save everybody until he learns to believe in himself. Yep, it’s a “Chosen One” narrative, in which people even use the term “Chosen One” on a regular basis, mostly without irony. And the main crux of the film is whether Peter Pan will learn to believe in himself enough to claim his “Chosen One” status, as signified by his ability to fly. The lack of Wendy isn’t just a problem because it leaves the movie very much male-dominated (although there is one female character, Princess Tigerlily, played by Rooney Mara.) It also leaves the movie without anybody to invest in, story-wise. The movie isn’t able to invest enough emotion into Peter Pan’s Hero’s Journey to keep it urgent, and meanwhile Peter keeps getting upstaged by other characters in the film. The thing is, Peter Pan has always been a character who works best as a foil for Wendy. He’s the boastful, wild, spritely boy who refuses to grow up and flits around getting into trouble. Wendy’s struggle with her own options—growing up and having a normal life, versus staying as a kind of surrogate mom to the Lost Boys—give the story a lot of its emotional core. Perhaps sensing that its version of Peter Pan is not going to be enough to keep viewers invested, the movie adds a Han Solo to his Luke Skywalker. Captain Hook is one of the good guys here, although there’s tons of heavy foreshadowing that he’ll eventually turn evil. Hook is a cowboy, for some reason, and he’s played by Garrett Hedlund, who is very much acting like the poor man’s Jensen Ackles. You know that Richard Nixon quaver that actors sometimes stick at the end of a line to sound cranky in an endearing, funny way? Hedlund does that with pretty much every line of dialogue. There’s also the fact that J.M. Barrie’s original Peter and Wendy is a racist narrative in which the natives are called the “Piccaninny Indians” and they act like a dreadful caricature of Native Americans. It would take a deft touch to handle this without screwing up—this film sort of turns these natives into African tribespeople as reimagined by Cirque du Soleil, with lots of neon hair extensions. They have a random Asian dude doing Kung Fu, but their main spokesperson is Princess Tigerlilly, who’s played by the very white Rooney Mara. So yeah, not deft. And turning Peter Pan into a literal white savior who is the Chosen One of this Native tribe is probably the wrong way to go, too. 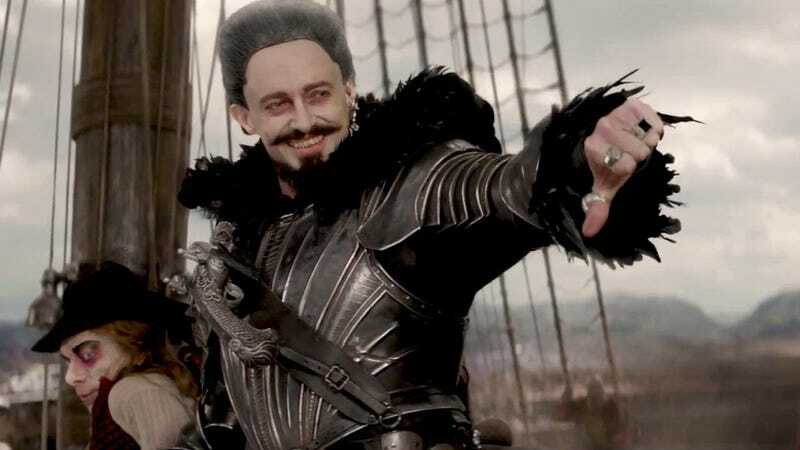 The movie’s saving grace is Hugh Jackman as the villain Blackbeard, who is just having so much fun playing a campy villain, he almost single-handedly saves the film from itself. When we first meet Blackbeard, he’s leading all of his thousands of mine slaves in a mostly a capella rendition of Nirvana’s “Smells Like Teen Spirit,” and he continues to be such a delightfully engaging villain, you kind of want him to win. Like Alan Rickman in Robin Hood: Prince of Thieves (and so much else), Jackman pretty much owns this film. And there are definitely fun moments here and there in Pan, even apart from Jackman’s scenes. The film doesn’t have a strong storyline, but it does have a sense of fun, and there are some set pieces involving flying pirate ships and mermaids and weird skeleton birds that are straight-up thrilling and lovely. Peter Pan is a pantomime character at heart, and this film definitely wants to be a pantomime, at times. It doesn’t quite have the courage of its camp convictions, though, and the rest of the movie can’t quite live up to its camp villain. I think it’s partly a matter of pacing. A panto needs to be kind of relentless with the goofy set pieces, and this pantomime dromedary has a lagging hindquarters. Some characters just don’t need an origin story, and Peter Pan is probably at the top of that list. He arrives fully formed, because he just is. He’s the boy who never grew up, and his origin is often sort of fanciful, like the notion that he ran away the day he was born. Peter Pan is one of those characters who loses some of his magic the more strenuously we explain him, in fact. Pan was directed by Joe Wright, who previously directed beautiful, stylish films like Atonement and Hanna. And much like Martin Campbell directing Green Lantern, Wright seems like a terrific director who’s ill at ease with a big, crazy, VFX circus. It’s noteworthy that the first act of the movie, which takes place in the “real” world, has an emotional weight and substance that the rest of the movie struggles to find again. (Although I feel like I’ve seen a hundred other movies lately that had a great first act and then struggled after that.) Wright is clearly having a lot of fun with some of the movie’s big set pieces, but the more cluttered the movie becomes, the less his skill at bringing out character seems to be in evidence. But it’s worth singling out the film’s score, by John Powell, which is just beautiful and the perfect “action-adventure movie” music. I kept being a bit bored by what was happening on the screen, but the music managed to sweep me along with its upbeat melodies underpinned by hints of melancholy. Pan left me wondering if it’s even possible to do a Peter Pan movie successfully, in this day and age. The character is such an artifact of a previous era, with its ideas about gender and race, that you need to take huge liberties to make it all work. This movie basically tries to “fix” Peter Pan by turning him into a cookie-cutter “Chosen One” hero. But like a number of other pulp heroes from 100 years ago, Peter Pan has inspired so many other things that the best you can hope for is something that feels derivative. Peter Pan may never grow up, but maybe we’ve outgrown him.